"The only thing that hadn’t been taken from her this Halloween was her heart, filled to the brim with malice. And it would never stop beating until she had exacted her revenge…"
Welcome to 800+ Years of Neopets! To celebrate the 800th edition of the Neopian Times, I wanted to create this guide to pre-historic Neopia, the land before we ever knew it! 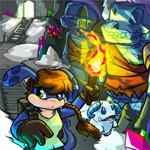 Neopia as we know it has existed for 18 years, as that is the time when users discovered the site and started inhabiting it alongside our Neopet friends. 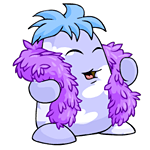 Weewoos aren’t the only ones who can pull off feathers, now your own Neopet can too! There are numerous Neopoint and NeoCash feather options to make your pet standout in the crowd. This article will give you tips on what items and themes you can use to incorporate those feather closet items into one of a kind customizations. Neopia is a wonderful world with so many great places to see and so many incredible things to do! We are going to take a path through the perfect 800 hour vacation in Neopia! You sure don’t want to miss out on anything it has to offer! Most pets were afraid of the Lab Scientist and his Lab Ray, and Mack understood that fear. He could remember the first time he tried it: the way his stomach did somersaults, his knees shaking so badly he could barely step onto the platform, and the Scorchio with a crazed glint in his eye. Although he had gotten a feeling that he should run far, far away, some type of steeled determination inside him made him step up to the platform and face the ray head on. After a burst of light and a weird tingly feeling, Mack opened his clenched eyes. "You’re a little faster now," the Scientist said nonchalantly, turning the ray off. "Two movement points more, to be exact." "That’s it?" Mack had asked. "That’s it. You can come back tomorrow." Nowadays, when it came to the Lab Ray, Mack had no fear. He went every day, saying hi to the Scorchio, and awaiting what change he would feel today. Usually it wasn’t much. Sometimes he got a little stronger or lost some defense. Sometimes there were no changes at all. On really unlucky days, he would go all the way back to level one or even change gender. It was always hard to adjust to being a girl, but Mack usually managed. Fortunately, he had stuck as a boy for quite some time now. On the best days, he would change species or color. Those were always fun. Mack had been nearly every species under the sun at this point. His favorite memory was of being a Robot Mynci. That was really neat. Mack had been zapped so many times he almost couldn’t remember what he started as. But every so often he pulled out his photo album of all the different species and colors he had been and went all the way back to the first page. The first time he ever went in, he was just a dorky red Moehog. But right now, he was a proud Desert Poogle. Mack hadn’t changed color or species in a while, but he was okay with that. He liked the way he looked at the moment and hoped he could keep it that way for a while. He fit right in at the Lost Desert and it made haggling with the shopkeepers there easier. Prince_Hailstorm and M0n0xid3 were enjoying the cool breeze by the water and relaxing to the sounds of chirping Pteris nearby. The heat of the summer had been unbearable, always feeling like you were in the Lost Desert, so the breeze was most welcomed. The friends had decided to take advantage of the break in the weather to go fishing, which mainly involved sipping cool lemonade, talking, and being generally lazy on the riverbank. Hail and M0n0 had a great friendship- they understood the balance between having fun as well as being able to spend time in each other’s company in silence while they pondered their own thoughts. M0n0 broke their current silence, "Do you know the Annual Gormball Championships are coming up? I’d sort of like to go watch them; I haven’t played since I got the avatar so it’d be fun for old time’s sake." "Oh yes, that would be fun! When I was playing for the avatar I’d started collecting statistics concerning the probability of the Gormball exploding and its correlation to the elapsed time in that round. I could increase my data sets much easier by watching- it was very difficult to play and take notes at the same time!" Hail responded enthusiastically, excited by the possibility of getting more reliable results for his data. "I can only imagine how hard that would be! I was trying to find a formula for game play myself, but I’d lose track every time I got the Steel Gormball, you know how easily I lose focus! Anyway, it was so frustrating to see so many points lost at once! Then when I finally got the avatar and a trophy I forgot all about finding a formula. It was so exciting! I knew the Gormball would normally explode anywhere between 4 and 15 seconds, so in order to maximize the chances of getting the bonus Gormballs I would only hold it for 1 second on my turn. I ended up with a few pink Gormballs worth between 1 and 6 points, an electric Gormball worth 22 points, a space Gormball worth 26 points….and I almost lost all of my chill when I got a fire Gormball worth 30 points! I was sure I’d end up losing and not getting the times 4 bonus for winning, but I won! It was a chilly September day in the town of Neopia. Leaves were rustling in the wind, the sun was just about to start setting, and the smell of warm cocoa filled the autumn air. Lily the Kacheek was enjoying her daily walk, which calmed her as she closed her eyes to breathe in the fresh air, until she heard a small noise which seemed to grow louder… "Excuse me, excuse me! Out of the way please!" It was a little pink Cybunny skipping in Lily’s direction, who seemed to be in a hurry and had a nervous look on her face. "No time to chat, I’ve got a busy day of hopping around ahead of me!" And the Cybunny skipped away into the distance. Lily squinted her eyes, shielding them from the sun, and faced the direction the Cybunny was hopping in. "Was that… Daisy? Strange, I don’t even think she recognized me! That was an interesting watch she was carrying too, I wonder what it was fo—" Lily paused as she realized she was talking out loud, then subtly looked around, hoping no one was there to see that she was talking to herself. She continued her walk and soon enough came across the Chocolate Factory, which carried her favourite gummy snack, Blueberry Gummy Slorgs. Lily wondered if she should treat herself to this snack, but also knew her Mum wouldn’t want her eating sugary sweets before dinner. "You know what," she said again out loud after a few minutes of contemplation, "my birthday is coming up so I’m gonna make this one exception and eat some Gummy Slorgs before dinner." Not caring this time if anyone was around to listen, Lily stepped into the shop and walked to the aisle to grab hold of her favourite gummy snack. "Oh hi, Lily," said a soft voice. Lily turned over her shoulder to see one her best friends standing behind her. "Lupin!" she exclaimed with excitement. "It’s so nice to see you…" Lily’s voice drifted as her eyes made her way to a beautifully wrapped present which Lupin was carrying. Lupin the Kougra noticed Lily staring at the gift he was holding, hid it behind his back out of sight, and cleared his throat. The heat of the summer had been unbearable, always feeling like you were in the Lost Desert, so the breeze was most welcomed. How Soon is "Too Soon"? So did I make it...?